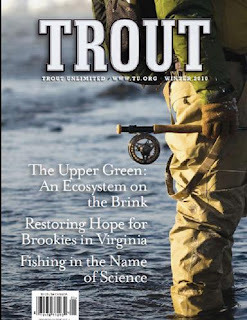 Georgia’s Eastern Brook Trout Joint Venture (EBTJV)/GA TU Back-the-Brookie was recognized in Trout Unlimited's Winter 2010 TROUT Magazine Actionline! For brook trout in Georgia waters, more habitat improvements are on the way, thanks to $25,000 in recent funding through the Eastern Brook Trout Joint Venture. Georgia TU, the Georgia Department of Natural Resources and the U.S. Forest Service are planning restoration work on 10 stream miles, including stretches on Big Net Creek, Upper Chattahoochee River, North and South Fork Moccasin Creek, Flat Branch, Tate Branch and Walnut Fork Creek. In past work, volunteers and partners conducted genetic sampling, removed non-native trout, tested water quality, mapped, “drought-proofed” streams by creating deeper pools, and constructed barriers to keep native brook trout populations sequestered from invasive fish. The new efforts will expand on previous work—which has been funded by Embrace-A-Stream and Georgia Power Foundation grants—to restore brook trout populations in the southernmost part of their native range.